Ensemble as Chorus. Photo by Jenny Graham. Daniel José Molina (Henry V) and other cast members deliver many truly spectacular moments — especially in Act II — which make this Henry a must see. Unfortunately, Director Rosa Joshi’s choices diminish the impact of the play itself and leaves the audience to appreciate master-class acting set in a confusion of activity. I think the audience is supposed to [endlessly] appreciate the turmoil and indiscriminate horrors of the machine of war. Toward that end, actors push stacks of boxes across the stage mimicking siege engines or walls or something. In fact, the before play opens members of the cast are twisting a changing pile of boxes around and around upstage. I’m sure it’s meaningful. But, the only thought these leaden-looking props give me is that the director has seen too many Transformer movies. To add to the disorder, the actors play multiple roles, sometimes up to 6 or 7, if you count “Chorus” and “Ensemble” separately. The differences among the actors’ personas seems deliberately vague as if to remind us how similar to each other all sides in a conflict are. The problem, of course, is that Shakespeare had a plot going, and it was hard for me at times to tell who/which person or which side was doing was doing what. If the actor had a hat on he was an English low-life, without it he might be a French noble. Grrr! Chaos on Stage: Jessica Ko, Kimberly Scott, Robert Vincent Frank, Shaun Taylor-Corbett. Photo by Jenny Graham. The effect of the chaos is distraction, not drama. I was horrified to hear the rousing, “Once more unto the breach, dear friends, once more” go by like a throw-away line, losing the competition for attention to some random movement, yelling, or flash bang device going off. Act I starts off well with an interesting delivery of Chorus’ “O for a Muse of fire…” I also appreciated the early court scene where Henry tries to ensure the righteousness of his going to war. Very nice, deliberate acting. But, then the plot becomes secondary to the motion on stage for the remainder of the act, save for one show-stopping moment. Last year’s Falstaff, well known and well liked actor, G. Valmont Thomas, died last December. This Festival season is dedicated to his memory, and many of the Henry V cast worked with him as Falstaff in Henry IV parts 1 and 2. Pistol’s line stopped hearts throughout the theater for it was too true. Act II cruised along uneventfully until Molina started interacting with individual characters. My daydreaming was first interrupted when Henry confronts his old friend Bardolph, played by Robert Vincent Frank. Bardolph has been caught misbehaving and was brought to his buddy Hal for adjudication. The lines stopped and the two men looked into each other’s eyes, the damning transaction completed wordlessly. Henry follows through with Shakespeare’s narration, but the sentence, appeal, and rejection were all done by the eyes. Both men communicated completely without a sound. From that scene on, we are treated to excellent vignettes, usually involving Molina. Henry’s wandering in disguise among his troops, picking up their mood, works well. The battle scenes blur but Henry’s humanity away from the overwrought staging is mesmerizing. Even the courtship scene with the French princess (Jessica Ko) gives a tenderness that avoids any disempowering smirk of politics. This Henry V showcases Daniel José Molina. His acting has improved from flawed in his first OSF seasons to artistry in this starring role. It’s very worth seeing. 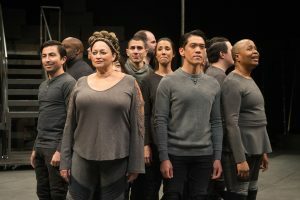 Daniel José Molina as Henry V. OSF photo. I am glad the director allowed Molina and the other actors time and space to deliver their performances. I just wish she had given Shakespeare and his story the same courtesy. 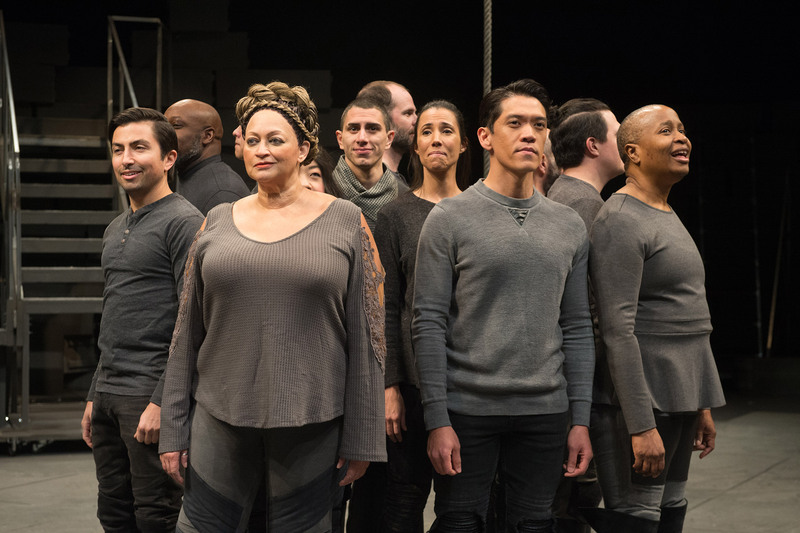 This entry was posted in osf, plays and tagged #HenryVOSF, Ashland, four stars, Henry V, legos, Oregon Shakespeare Festival, OSF, play review, plays, scenes, Transformers. Bookmark the permalink.